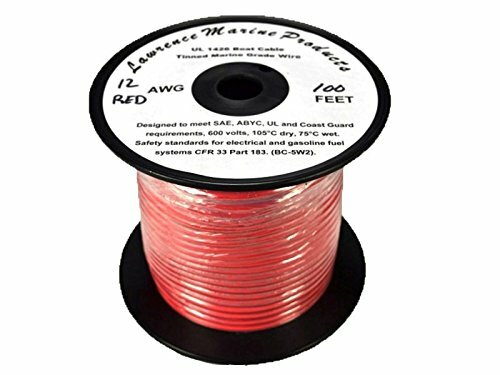 12 AWG Tinned Marine Primary Wire, Red, 100 Feet by Lawrence Marine Products at Breezin Thru Charters. MPN: 12RD100FT. Hurry! Limited time offer. Offer valid only while supplies last. Type III 65/.0100 Stranding. Nominal OD .162 inch. Tinned Marine primary wire available in many colors and is also very flexible, Type III stranded. Type III 65/.0100 Stranding. Nominal OD .162 inch. Tinned Marine primary wire available in many colors and is also very flexible, Type III stranded. Tin plated copper stranding with a jacket resistant to moisture, oil, chemicals, gasoline fuel and excellent abrasion resistance. Designed to meet SAE, ABYC, UL and Coast Guard requirements, 600 volts, 105°C dry, 75°C wet. Safety standards for electrical and gasoline fuel systems CFR 33 Part 183.(BC-5W2). If you have any questions about this product by Lawrence Marine Products, contact us by completing and submitting the form below. If you are looking for a specif part number, please include it with your message.